Nothing got in the way today so here are not just one but two new Valentine’s freebies. 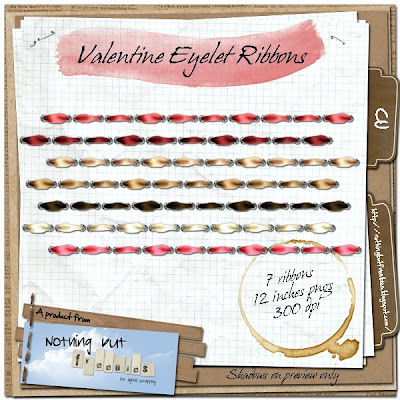 I’m really getting romantic, in the girly way, so you get a set of 7 eyelet silk ribbons and a pack of 14 heart charms. Both are made with actions from Marbled Circle. Please notice - both are CU! Click images for direct downloads. If you want chains for the charms you can get them here. 4shared works in mysterious ways... The chain download should NOT have a password so I can not explain what is going on. But you can try this new direct download. I hope it works! See you Friday for A Little Bit. 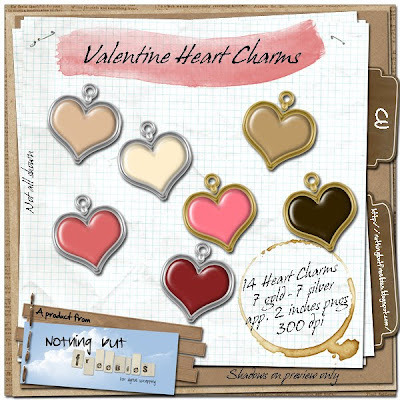 Thank you for sharing these great heart charms and lovely eyelets with us. thank you! These are great!!! Thank you for the great charms & ribbons. Ribbons...charms...even chains! You think of everything Trine, thank you! These are great--I especially love the eyelets! Thank you!!! beautiful , thank you ! I was interested in the Chains , unfortunately 4Shared is asking for a password ... :-( : any clue ? Thanks so much for these pretty eyelet ribbons! I just discovered your site thru digiscrap depot and wanted to express my thanks. You have so many beautiful goodies and I so appreciate your generosity in sharing them. I'm especially loving the eyelets today! Just found your site! Love the eyelets with the ribbon! Thanks so much! Thanks for the pretty ribbons! These are absolutely fantastic. Thank you. Thank you for sharing your awesome eyelet ribbons. Thank you for being so generous with your talents :0) the eyelet ribbons are beautiful!